Last week we spent the entire week on one electrical upgrade for a 42 year-old woman with cerebral palsy. Virginia is confined to a wheelchair, but is trying to live on her own, and in her own home. She is unable to work and has a yearly income of less than $8K a year. Our first task was to upgrade her electric service panel. (where the power comes in at the meter) The existing panel was very likely the original – which would make it 60 years old. The box had only two screw-in fuses and only 12o volts. 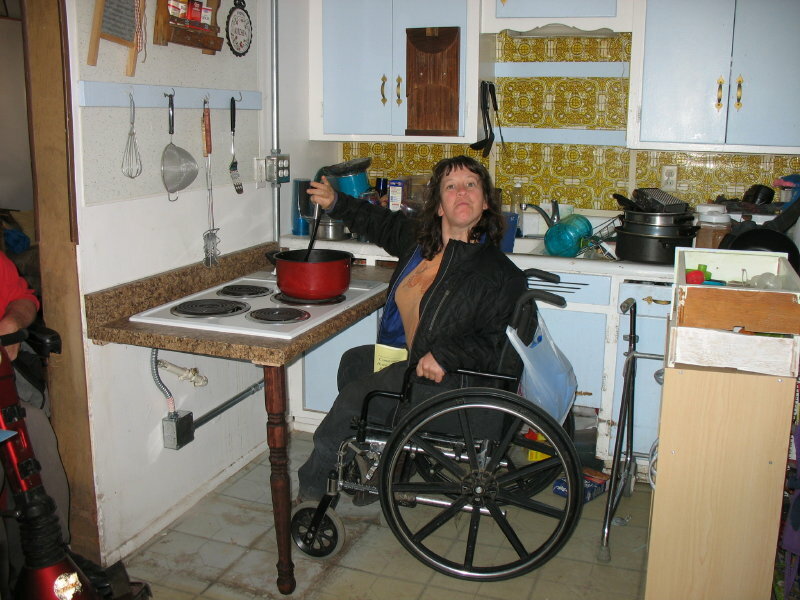 One of the things Virginia had hoped for was an electric cooktop, so that she could reach the controls and the pans from her wheelchair without reaching over the flame of her gas range. Because she didn’t have 240 volts required for a cooktop we had to first upgrade her system. Some of the wiring was so old that when we removed the old panel the insulation on the wires going into the house just crumbled, and when we tried to reenergize the lines, the new circuit breakers tripped. That meant half a day of repairing the old wiring, which was inside the concrete block walls. Since the walls were concrete (and houses don’t have basements down here) Eli ran the wires for the new cooktop on the outside walls through metal conduit, then through the wall into the kitchen. First she fitted and attached the conduit, and then we had to pull all the wires through. Scott was able to find a used cooktop (donated) and another CHRPA worker came and installed the cooktop in a new countertop. This afternoon we went to look at our next upgrade that we’ll begin tomorrow morning. The family currently has no gas to their home, and consequently no heat – and from what we saw, it’s doubtful that their furnace would have worked anyway. That seems insignificant after my mention of 80* temps, but earlier in the winter months the temperatures can get into the 20s and teens, and homes here, especially those of the people we work for, are poorly insulated, if at all. A leak was discovered in the gas line (imbedded in the concrete floor) and they didn’t have money to have it repaired, so the gas company shut off the gas and removed the meter. CHRPA will soon be replacing the gas lines AND the furnace. The family’s water bill was in arrears, and so the water was shut off too. A “good Samaritan” (sort of) neighbor, came by and turned the water main back on for them, but the water department discovered the “good deed”, and now the water has been shut off again and a lock placed on the main. That problem will have to be addressed by the family. So at the moment the family has no gas, no water, and a dangerously defective electrical system…AND a leaking roof. So Eli and I will repair the electrical problems, CHRPA will repair the gas line and replace the furnace, and CHRPA will contract with a roofer to replace the roof. About three weeks ago we worked for Melvin, who lives in a very old mobile home, also without heat, and with only an extension cord run in his bedroom window for power, and to run an electric heater. Our “nightmare scenario” here is hearing the client tell us that a neighbor down the street “who knows a lot about electricity” came and tried to repair his electrical problems. That always sets our teeth on edge. Well it seems that Melvin’s “friend” came by to repair not only the electrical panel, but also the furnace. He tore into both, got in over his head on both, and then left – never to return. Melvin said his furnace hadn’t worked for over 5 years! And more than half of the plugs and lights in his home hadn’t worked for about the same period. Eli and I tackled the electric and found it beyond repair, and so we replaced the entire electric panel, and the feed into the home. When we were done and began turning on the new circuit breakers Melvin walked around the house and kept repeating: “I can’t believe it…I can’t believe it.” You mean THIS works now? My microwave will work? The lights work? Later the next week Tim, one of the staff workers, replaced the furnace with a new one. Then he replaced Melvin’s front door. 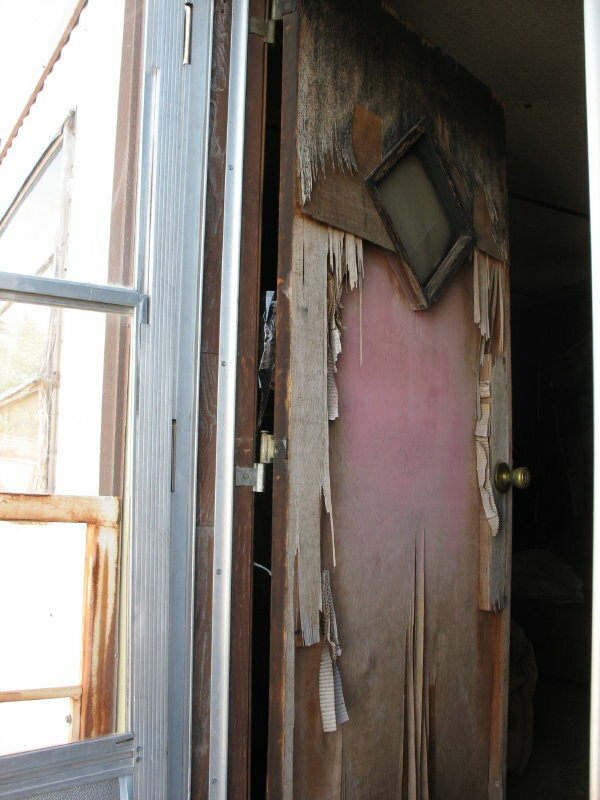 The work request that we had received from the county “Council on Aging” said to “Repair or replace” the front door. Which option would YOU have taken? Melvin’s living room floor also had a few holes, so another CHRPA crew was there two weeks ago and repaired his floor. CHRPA has been in existence for 22 years, and there seems to be no end to our job security. Thanks for your continued prayers and financial support. With a little help from Toby and a steep learning curve for an aspiring geek, here are some photos of the CHRPA “campus” and a few shots of our jobs so that you can visualize where we are and what we might be doing. First, is our present “home”. The CHRPA office is the green building behind the red van. They just moved in last summer. Before that the “office” was a large closet – now a laundry room – in the VS (voluntary service) house. 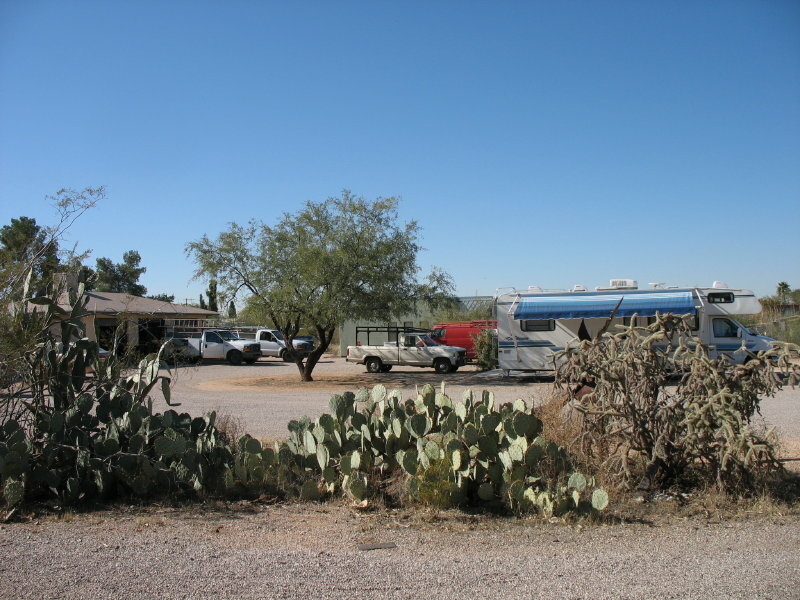 Our RV, our home, while we are here, is behind the Cholla cactus in the foreground. Our truck that was stolen was parked right where the van is in this photo – and we were in our RV at the time! (The guy wasn’t timid. It was 2:30 on Sunday afternoon.) The shop is on the left, and that’s where we keep all the tools and supplies when they aren’t on one of the trucks. A Curved Billed Thrasher lives in the Cholla and sits on top of the plant and sings for us almost every day, if we are around. Below is another perspective. Looking from East 30th Street, the Shalom Mennonite Church is on the left, the VS house is straight back, and our RV is obscured by the 5th wheel trailer on the right. You can see the shop beyond the hedgerow on the right. Things have come together for us here now, our new truck runs well and provides us with more room and more tool storage than our stolen one did. It’s much more comfortable on our backs too. The word went out after our truck was stolen, and as of today CHRPA has two “new” (old) trucks to replace it. Last week TEP (Tucson Electric Power – the local electric company) came by with an enclosed utility body truck that they donated. Meanwhile the pastor at Shalom Menno Church who comes from Ohio contacted some friends in Kidron and the Kidron Electric Co. donated one of their vans to CHRPA too. The question of how the van would find its way to Tucson came up and a local Sunday school class decided to use some of their mission funds to finance the trip and a couple from the church drove the van down. It arrived two weeks ago, and is already part of the “fleet”. Much has happened since our last post. We learned this week that the Tucson police had arrested a person in the utility truck – but not without a chase – and a tree. That explained the flat tires, bent rims and damaged front end. It also explained why some of our tools were recovered. We have been given a new truck that is much newer, bigger and more comfortable for my back than our first one. CHRPA is talking with Southwest Gas about getting another hand-me-down truck donated, but in the meantime they are minus one truck in the midst of their busiest season, i.e. with the most volunteers needing trucks. In 1987 I was working my first major MDS project in Maine and it seemed like just about everything that could go wrong did. I was getting very discouraged. A veteran MDS leader came up from Pennsylvania to help me and said something that I never forgot. He said “Whenever we are involved in any project and the adversary isn’t out there furiously trying to subvert our efforts, we have to wonder whether Jesus is in it or not.” It’s difficult to find that reassuring when we are in the midst of trials, but nevertheless the past weeks have affirmed for us that this is indeed God’s service. Our Taftsville faith community has been very supportive of our service work both financially and in prayer. We hope that we can keep everyone informed about our work with Community Home Repair Projects of Arizona here in Tucson. That’s quite a mouthful to say, so we all just say “Chirpa” here. Unfortunately as many of you know, our experience here thus far has been disheartening. Dec. 27, ‘07- Jan. 3, ’08: We made the long trip . . . Ohio, Kentucky, Tennessee, Arkansas, Texas, Texas, Texas, New Mexico and finally Arizona. Totaling just over 3,000 miles from New Hampshire. Temperatures remained cool. Low’s in Texas and New Mexico at night were 16 degrees and 18 degrees! We laid over for a day in Texas and a day in New Mexico to try to rest up a bit. The trip was uneventful – which was nice – no problems with the RV on the way. Jan. 4-5, ’08, Friday & Saturday: We settled in at our site in the church parking lot. The Shalom Mennonite Church is at the front of the lot. 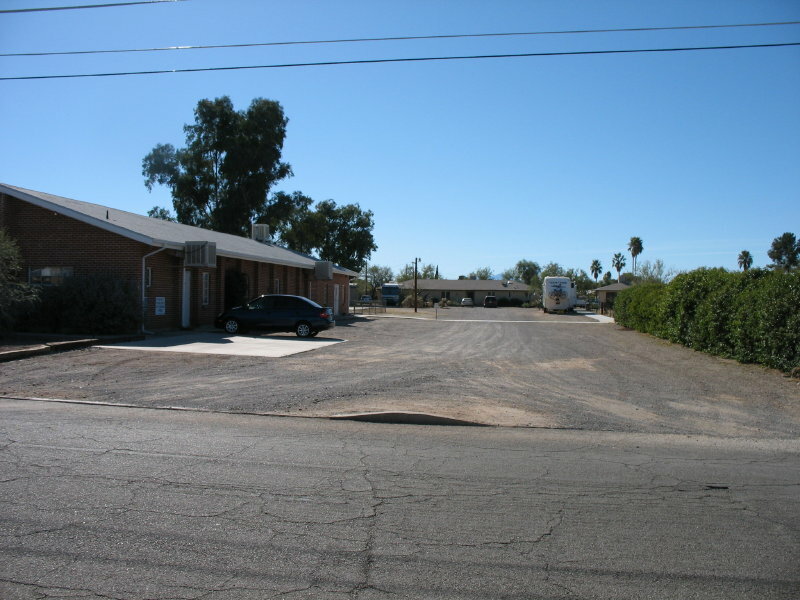 The Voluntary Service (VS) House is at the back of the lot and the Community Home Repair office is also near the back of the lot. Our RV site is somewhere in the middle of it all. Ted spent two days transferring his tools that we had brought along, into the truck that we would be using. He also cleaned the truck up, looked through the inventory and filled the truck with some additional CHRPA tools, parts, wire and cable. Then he filled it with gas, put new wiper blades on, etc. Jan 7, ’08, Mon. 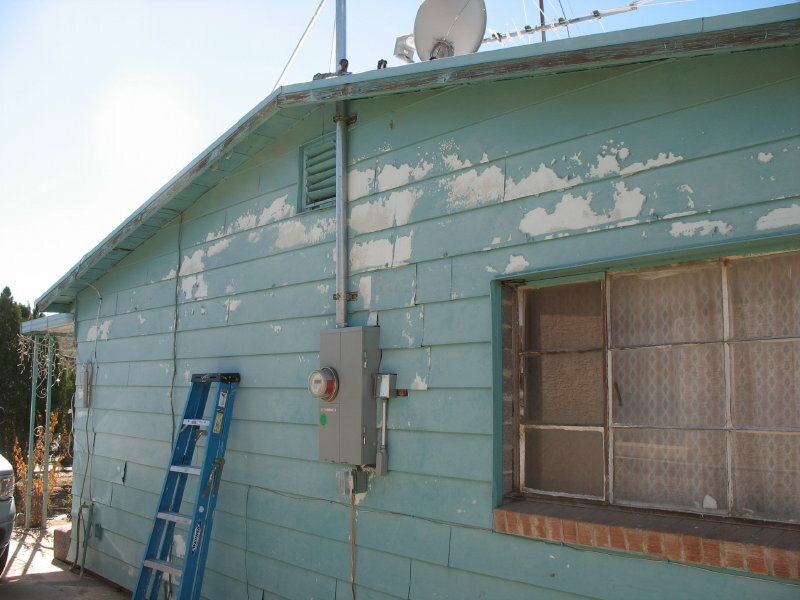 : Our first day on the job with Community Home Repair Projects of Arizona (CHRPA). We gathered at the CHRPA office to receive our work orders, then each crew heads out to load up their vehicle with tools and parts for the job they have been assigned. There were around 15 of us including staff, long-term VSers (young people usually in their twenties that volunteer for one or two years) and SOOPers ( short term winter volunteers like us). When Ted and I went out to get into our truck, it was not there. Ted has been known to play some practical jokes on other volunteers and staff in the past so we immediately assumed that this was pay-back and someone was playing a joke on us. We looked everywhere for the truck, then made the rounds of people trying to find out who was responsible. Everyone denied having any involvement and everyone seemed a little too serious. No joking here. Finally we realized that the truck really was gone . . .and our tools with it. The awful truth began to soak in. The other crews left for their job assignments. We were left standing. The police were called and a report was made. Everyone felt sick and I am sure Ted and I looked sick. think of them that way – including our new ones. Without using those words, I think that’s what Elinor and I have always intended. We learned something new about the theft this morning (Wed., Jan 9). One of the other older volunteers asked me this morning where I went with the truck Sunday afternoon after church. I said I hadn’t used the truck Sunday afternoon. He looked down at the floor and shook his head and said “I watched the guy drive your truck out of the yard. I thought it was you. I’ve been awake all night thinking about it.” So they took it in broad daylight at 2:30 Sunday afternoon right out of the church parking lot while we were right there. Elinor and I were in our RV, not 20 feet from the truck. It’s so frustrating because we hadn’t even been out on a job yet. I had spent two full days servicing and cleaning the truck and loading all our tools, CHRPA’s tools, and something like $800 worth of Romex and cable on the truck. CHRPA had just received a grant to buy tools and had put a bunch of brand new power tools in. They were still in the wrappers – hammer drill, circular saw, sawzall…..on and on. So clearly someone was watching me load the truck and targeted it, because ours was the oldest and dumpiest of the fleet. But the others weren’t loaded with tools and wire. CHRPA has been working here in Tucson for over 20 years, but being a non-profit, doesn’t have a big bank account. 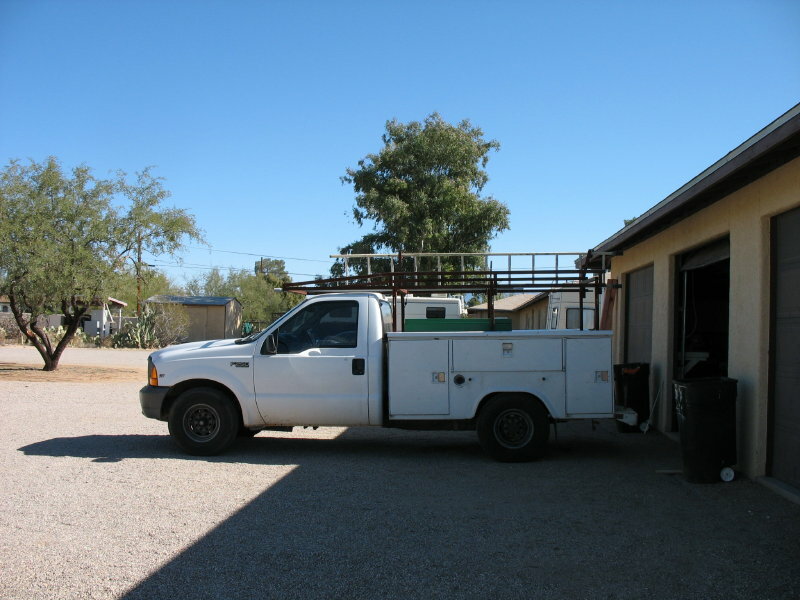 They rely on donated trucks from Southwest Gas and Tucson Electric Power. The truck we used was an ’88, and not in great shape, but now we are using the boss’s truck and he’s been riding a bicycle to work. Our first job has put things into perspective for us. The young couple (20s) with a daughter in kindergarten have no heat and no hot water. They can’t afford the deposit and other expenses of having a propane tank put in. They don’t have a kitchen range, and heat water on a hot plate for bathing and washing dishes. The water line to one toilet is broken, so they flush with a pail of water. In the other bathroom the toilet isn’t attached to the floor, the float valve was broken, and they had a string coming out through the hole in the tank where the handle used to be – tied to the flapper – to flush. The mobile home is an old one (1970) with all aluminum wire, and they had used an electric space heater to heat the bedroom and it overloaded the circuit, but rather than blow the fuse it heated the panel until the screws were red hot and the insulation on the Romex melted. (no, there wasn’t a penny behind the fuse) Their roof leaked so badly in the past that the ceilings are sagging and they had to take the glass globes off of the ceiling lights because they were filling with water when it rained. They repaired it as well as they could although it still leaks at one or two places. AND ALL WE LOST WAS A FEW TOOLS. (theirs was broken) and repaired the roof today. We’ve bought some new tools so that we could begin some work, and so far just replacing hand tools and some wire we’ve spent over $1600. The director of the CHRPA program feels that they should absorb the cost of our tools, but they don’t have a lot of money either. We estimated that CHRPA lost about $1300 worth of tools and $800 worth of wire and perhaps another $800 worth of parts. Initially we estimated our own tools at $4,000 but now that we have been looking at prices in the stores we realize that is probably on the low side. Before we went to work on Thursday morning Scott told us that Sonya (CHRPA Administrative Assistant) took a phone call. On the other end was the voice of a little girl. Her first question was, “Do you help families?” Sonya replied, “Yes, what do you need?” The girl answered, “It’s cold at our house.” (It had been 35 degrees the night before.) Sonya asked if her mother or father was there and she heard the girl knock on a door and call her mother saying, “Mommy, I called one of those numbers and the lady wants to talk to you.” The mother is a widow with three children. Another SOOPer and a VSer were sent to repair their furnace on Thursday.